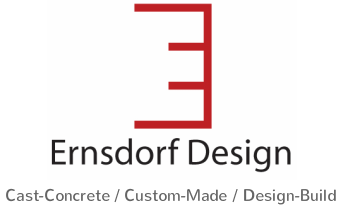 Ernsdorf Design is a family-owned and operated art studio, that specializes in custom-made cast-concrete furniture and art. For over fifteen years Ernsdorf Design has cast a myriad of elements ranging from the sublime beauty of concrete counter-tops...to the ever-comforting fire pit...to world-class museum projects. We have an excellent reputation for quality, durability, and on-time delivery. Our staff of talented artisans are committed to crafting attractive and lasting pieces for you and your clients. All inquires, click onto our Quote Request page, complete the email inquiry form, and click "submit".